The North American solar market has developed a non-residential PV pipeline of over 62 GWdc, representing over 4,000 individual projects. 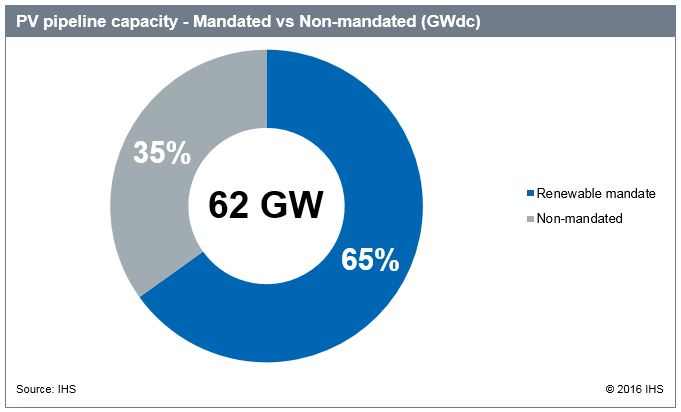 The vast majority of this capacity is under development in the United States, driven by a combination of renewable policy mandates and competitive, voluntary utility procurement. Historically strong markets such as California, North Carolina, and Nevada are associated with the largest PV pipelines in terms of capacity, but Texas and Florida represent sizable, multi-gigawatt pipelines as well, with both markets poised to emerge rapidly in 2016. North America remains predominantly driven by markets governed by renewable mandates, but IHS notes that 35% of the pipeline is being developed outside of such policies, representing a growing portion of PV demand in the region. As of Q3 2016, the PV project pipeline in North America stands at over 62 GWdc according to the IHS Solar Deal Tracker. With the extension of the investment tax credit (ITC) in the United States, the project pipeline has continued to grow, with projects and utility requests planned from 2016 through 2020 and beyond. Though some of the capacity originally under development for completion in 2016 has been pushed back due to the policy update, the bulk of the pipeline in North America remains associated with near-term deadlines from 2016 to 2018. In North America, IHS has identified five key state markets with PV project pipelines larger than 3 GWdc, representing over 60% of PV capacity under development in the region. 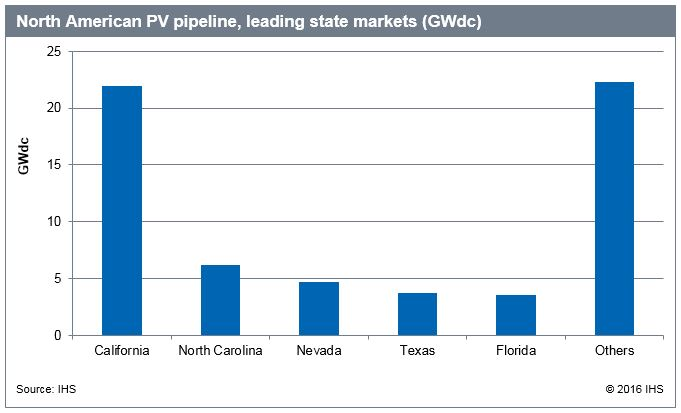 Leading states like California, North Carolina, and Nevada represent the top three markets in terms of PV capacity under development, but markets such as Texas and Florida are rapidly emerging in 2016, both associated with multi-gigawatt pipelines, predominantly comprised of utility-scale projects larger than 50 MWdc. Concerning what’s driving PV development in North America, IHS notes that a growing proportion of demand is originating outside of renewable policy mandates. Specifically, while the majority of the PV pipeline can be attributed to market demand stemming from renewable policy mandates, 35% of PV capacity under development in the region is being driven outside of such mandates, predominantly through either long-term contracts secured via Public Utility Regulatory Policies Act (PURPA) mechanisms in markets like North Carolina, Utah, and Idaho, or through competitive, voluntary procurement by utilities in markets like Texas, Florida, and Georgia. Particularly in the Southeastern and Midwestern regions of the United States, utility-scale PV is rapidly becoming economically attractive to utilities, driving them to request such capacity to both reduce emissions and secure long-term power contracts at competitive rates.